Organic Cotton & Wool Latex Core Dreamton Mattress - Best selling and Handcrafted in US. The Dreamton Mattress with its natural latex core is one of our #1 best sellers, and with good reason. So soft and plush, you’ll never guess it’s made from wool and latex. This dreamy combination is perfect for sleepers who want a firm core, with plenty of cushion to sink into on the outside. With a 3” natural latex core sandwiched between a soft, fluffy organic cotton core, wrapped in 1.5” of our most luxurious natural wool, this mattress is everything you wish a natural mattress could be. In sizes from crib to California King — and in custom sizes, too — these all natural mattresses offer an organic and hypoallergenic alternative in every size. Here at White Lotus Home, we hold our shepherds to the highest standards of quality and ethics. Our sheep are raised on rotating pastures to prevent erosion and overgrazing, and their beautiful wool is never treated with chemicals or flame retardants. Wrapped in approximately 1.5” of the finest wool we source, the Dreamton mattresses are naturally antimicrobial and dust mite resistant, and require no flame retardant chemical treatments to be safe. Wool is comfortable in the summer and winter, thanks to its natural insulative properties. The Pure Cotton and Latex Dreamton Mattress is one without springs, and as such won’t transfer motion between sleepers. We recommend putting it on a box spring set or platform bed, or even using it as a floor bed. A slatted bed frame is recommended for air circulation and the slats should be at least 2.5" wide and no more than 2" apart from each other. When the slats are more than 2" apart, that may affect the longevity and comfort of your mattress. Soft and responsive, the Latex and Wool Dreamton is a mattress unlike any you’ve ever slept on, and is the all natural sustainable mattress of your dreams. Most of our orders are shipped through FedEx. After you place your order, you’ll receive a tracking number so you can anxiously await your new mattress. If located in Alaska or Hawaii, to an APO box, or outside of the US, your order will ship via USPS. Please note that these shipments do not automatically come with tracking, but that tracking numbers are available upon request. Larger orders may need to ship via FedEx Freight. Ordering a king sized mattress? Orders exceeding 150 lbs may need to be shipped via FedEx Freight of a private shipping company. Your tracking information will be updated accordingly. December 2016 Marissa Patti Great company with very quick response to inquiries! I cannot stress enough how important it is to sleep without chemicals. I love my bed so much! I bought an organic bed because I was suffering from sleep apnea. I would stop breathing in the middle of the night and wake up violently! Going organic (mix of latex, wool, and organic cotton) has stopped my sleep issues completely. It even brings me deeper sleep and more complex dreams. Does it make a difference in the performance of this mattress between putting it directly onto the slats of a platform bed vs putting a box spring onto the slats and the mattress on top of that? The foundation needs to be nice and even, that would be the best way for our mattresses to perform the best it can. It also depends on the wear and tear of your current box spring. 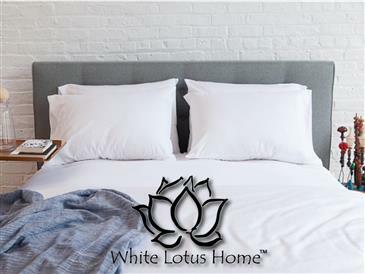 The best way to test this is, when you get your White Lotus Home mattress try it on the floor or on a flat surface and then try it on the slats or box springs.